Sometimes things in life are easier said than done, we all know that. For 60-year-old John Hutchings, he was adamant that he wasn’t going to build another seriously modified car again. How did that go for him? Well, not very good if this tough XK is anything to go by. 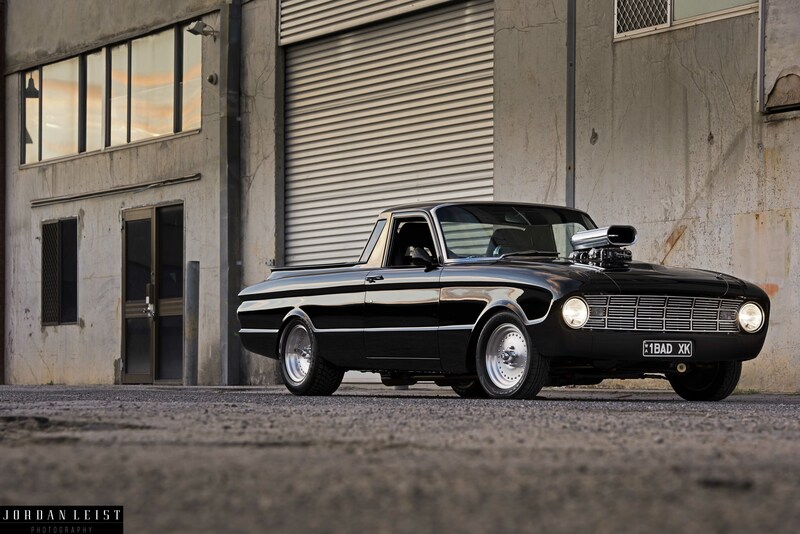 “For over 30 years I owned a pristine, original XW GT Falcon. I bought it standard and then I really went to town on the motor and did a heap of modifications. That was an angry car. A few years later, I decided to take it back to original again and I did a complete restoration on the car. It was immaculate, too nice in fact and that was the problem. I was nervous to drive it and I was always worried about damaging the car. As much as I loved it, well, I didn’t drive it enough so I sold it,” explained John. Deciding to take a break from cars was a tough decision but eventually, John felt the time was right to start again. “I just wanted a neat street car. Something I could just jump in and drive. This time though, I decided that I would chase up a car that was already built, to save some of the puss and pain.” John discovered a decent XK from over East and decided that is was a great option to tinker with. “It seemed to have a lot going for it – the V8 conversion, the 9-inch out the back and it some nice custom touches too. It was a good buy at the time and was a bit of fun but to be honest, it was a slug. The Cleveland in it was either as weak as piss or on its way out. After a pulled the motor from the car I had some mates look over the body with me and it was then that I couldn’t just leave it as is – it needed some work. I think once you lift that standard of the car in one area, the rest has to follow.” A great ideology to have no doubt but that decision was detrimental to John’s bank account over the 5 year build. One thing you notice about the XK besides just how arrow straight it is, are the abundance of custom touches on the car. “Some of the work was previously done to the car when I bought it but the quality of work was far satisfactory. In several cases, the old work had to be completely removed and then replaced. Terry didn’t want to leave any stone unturned before he applied the paint,” explained John. The front and rear roll pans have been restyled and improved; the radiused rear guards are in fact from the front of another Falcon, the gutters from the roof have been removed and custom tonneau cover is a two-piece item that flips up. John also managed to source a whole heap of new panels to help Terry out. “The grille is brand new and cost me big bucks. It is one of the only shiny pieces on the car. I loved the whole black and minimal chrome look. I think the car has a whole heap of attitude and it would be near-on impossible to imagine the car in another colour,” said John. Keeping with the black theme, John had Brett at 2-Tone Motor Trimming let loose on the cabin of the XK. “I gave him a bit of an idea of what I wanted and then let him do his own thing. He is only a young bloke, finding his way in the scene, and I like to give those sorts of guys a chance to showcase their skills. He did a great job overall.” The interior is all leather, with the bucket seats copping some perforated inserts for some extra class. The custom gauge fascia is chock full of Autometer units and launching out of the dash is the monster tacho that was custom fitted by Terry. A roll cage is nestled behind the seat and runs through a Lexan rear screen and into the tray. Removable bars run through the doors, for when John feels the urge to hit the drag strip. The harnesses are there waiting for some quarter mile action too. A Billet Specialties wheel and a B&M shifter complete the up-to-date interior. While the body and interior improvements were well and truly underway, John was sorting out the driveline, and the car was in for one hell of a shake-up. “For as long as I can remember; I have been using my mate John Hollings to look after all my engine stuff. I swear that he must have blue blood running through his veins. What he doesn’t know about Fords, well, it mustn’t be worth knowing,” laughed John. The new Windsor is no laughing matter though, far from it in fact. The 351 cubic inch donk runs a steel crank, forged pistons, H-beam rods and a Crane Cam. Dart Snr heads have been heavily massaged by John and flow extra hard now. Pretty much a trademark of Johns, are tunnel ram manifolds. His XW GT wore one, and before the recent WA Hot Rod & Street Machine Spectacular, he had Terry slice the bonnet up so a brand new, Weiand tunnel ram wearing two 600 Ultra HP carbs could reach up, high to the sky. Closer to the tarmac, is the custom exhaust fabricated by the one and only Norm Butler. “The engine revs hard as all hell and sounds unreal when you kick it in the guts,” exclaimed John. Mated to the motor is a fully manualised C4 ‘box with an Allfast 3,000rpm high-stall converter. The old 9-inch was freshened up with 31-spline axles, 3.7 gears and braced with a McDonald Bros 2-link set up. “One thing I really wanted was for the car to stop and handle well. I love the old school look, but there is no point having a tough driveline with standard brakes and suspension – it is a waste of time.” With that in mind, John has retained the full RRS front end, fitted Ranchero adjustable shocks in the back and had the rear leaves reset. Up front are 290mm rotors wearing 2pot pistons while the rear sees XF Falcon discs doing the work. With the car completed all that is left to do is drive the darned thing. “I have been waiting for the weather to clear up so I can finally hit the road properly. I want to go to a few Custom Cars, and Coffee meets and of course go to the drags. I reckon the car is awesome and I can’t thank Terry enough for all of his efforts. I honestly think he loves the car more than I do, he is that proud of how it turned out.” So, at the end of the day, John has kind of gotten himself back to square one – with a car that has turned out way better than it should have. “I am kinda kicking myself that I went this far with the XK, but I now have a new project on the go that has to be kept simple and nowhere near as good as the ute.” That new car is an XD Falcon. Tucked away in the workshop is a turbo Barra motor and just recently delivered is a Group C body kit. I for one can’t wait to see how that one turns out!